It was the happiest day of my life. No kidding. There I was, singing my heart out like it was the most important audition of my life (it was) on the stage of The New York City Opera at Lincoln Center. 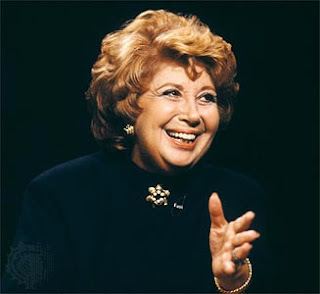 Beverly Sills sat in the tenth row all by herself, listening intently. I finished singing Mozart's Non piu andrai from Le Nozze di Figaro feeling like I was shot out of a cannon, and she smiled that famous beaming smile of hers and said: "Thank you very much!" While her head nodded emphatically as she spoke, it was her tone of voice that made me want to jump up and down like a kid at Christmas. Instead, I smiled, nodded in return and said: "Thank you!" An internal Yes! Yes! Yes! Yes! Yes! screamed in my head as I left the stage. The next day I got the call that I was now a member of New York City Opera's thirty-two member ensemble. And so began my two-decade journey. What a woman. You got within twenty feet of her and the air vibrated differently. A frank talking gal from Brooklyn, she knew how to run a company and raise a bundle of cash to keep her beloved City Opera going, all the while setting hearts aflame. As Horace Tabor said in Douglas Moore's The Ballad of Baby Doe: "You were always the real thing, Baby." Belated birthday wishes to Beverly. Dear Daniel, She's got an exquisite voice. I listen to her a lot at home. I love her record; Plaisir D'amour. I love her rendition of Les chemins de l'amour although I don't mind Jessie Norman pouring her heart out in such delicate French love songs. I suppose it depends on my mood. I've always wondered why the beautiful English soprano Jane Eaglen never records any French Arias. I love her voice ever since I heard her rendition of "The Dreame" in the film, "Sense and Sensibility". PS. I've enjoyed reading your Christine Brewer post. I have all her records at home and listen to her a lot. Daniel, you've got the most impeccable taste. It's outstanding! !